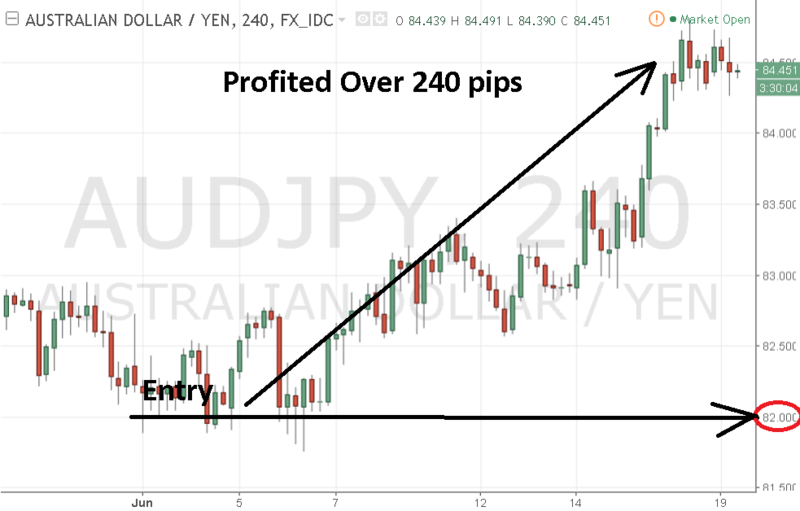 Here’s another trade we did at the start of the month on AUDJPY and now we are over 400% profit based on risk. So quite a few people ask me whether did me or my private community of traders traded on the news of the recent UK election. I actually don’t bother much about the news but we did go in to trade on EURGBP more than a month before the election. Now we are totally out of the trade with profits on that one single trade of over 400 pips. The election just allowed us to go into much deeper profits as the attached screenshots shows. The thing is this. We traded on the 19 April 2017 way before the news were announced in June 2017. 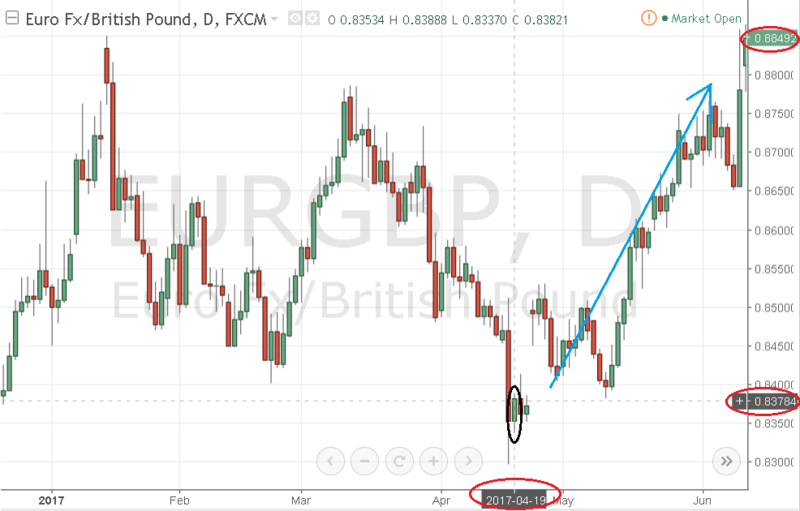 The same thing happened for BREXIT almost exactly one year ago when we traded GBPUSD roughly three weeks before the the referendum and voting was held. That trade was massively profitable for us too after the news of the voting was announced. The reason for all this, is by using and applying our time-tested and proven trading strategy/system, which we call Trade To Win trading system. A system, a measuring mechanism to measure the overall market crowd’s fear and greed to a high accuracy using our unique way of technical analysis. When you can determine the overall market crowd’s fear and greed to a high accuracy using a measuring mechanism, a system, then you do not need to follow or trade the news or even be bothered about it. Because naturally most of the times than not, you will trade the news before it happens. Here’s something extra for all to learn. Make sure your system is time-tested and proven over time to work. So I will be taking a break soon after doing another 2 workshop. My 2.5 hour free workshop talk where I share the techniques me and my past participants have used and applied to consistently profit from the markets to grow our wealth. 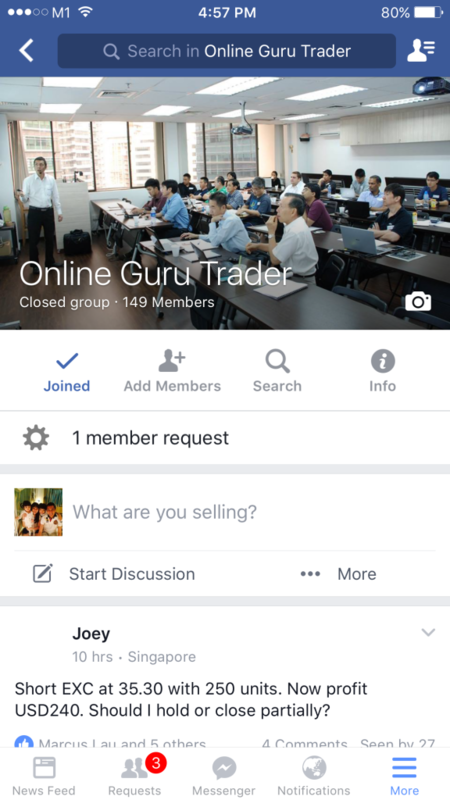 Consistently grow your account by 2% to 8% per month, month after month. 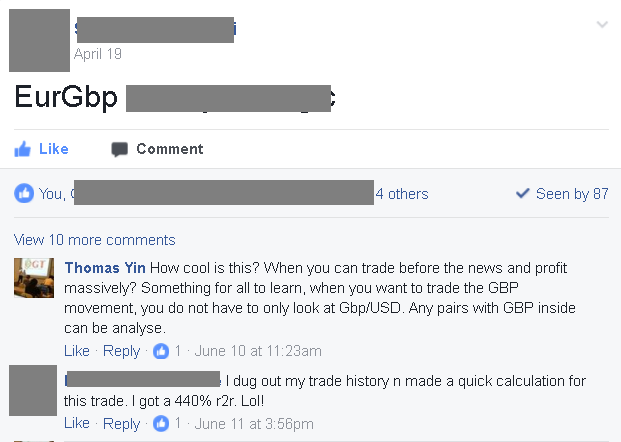 I traded gbpjpy together with my private group on the 24th May and got out with profits within a week. The best thing is, I didn’t even look for the trade. My students found the trade, posted it and we all traded it together. That’s synergy. And it’s r2r of 1:4.6, that’s 460% based on risk to reward. Check out the video. I particularly like this few sentences in the video. “I think, again, symbolically, at the very end of our lives, if we can still say you know, we were never humbled. We were knocked down but we got up and I can say I lived life with integrity and I took all the blows, and I still prevailed, I think that’s a good epitaph for anyone.” I am sure you will like the video. Since the second half of last year, I have been turned overall long term bearish on the markets. Those who followed me and been to my market outlook talks would think I am a naturally bearish guy on the markets but it is not true. Since 2010, I have been have been trading the markets with an overall long term bullish view on the markets. As a trader who use technicals to trade, I analyse the markets based on the charts. So my bearish sentiment comes from analysing the markets through the charts. By using the charts, I am able forecasted the small market crash in July 2015 during the greece crisis and a crash in a bigger extent in August 2015 during the china crisis which caused the dow jones to drop over 2000 points in just 4 trading days. As a technical analyst, I cannot tell you what events or news will move the markets. But using the charts, I can see when a shift is likely to happen. Posted on this blog last week to monitor EXC to short on 10th May before U.S. market open at 930pm on that day. After that, I had a webinar with my students that evening before market open and told them to monitor this closely for a trade using my Trade To Win (T.T.W.) trading system. T.T.W. system triggered a trade entry that very day after market opened. Here is the current chart of EXC up to yesterday’s close. Most typical technical analyst will say that it is a double top formed and that’s why it is going down. But most people will also say that by the time the double bottom is confirmed, it is always a bit too late to trade it. And if it is still early to confirm to say that it is a double top, when people trade it, normally what happens after that is the double top is not formed and breaks the previous resistance to set a new high. And that is why most analyst are analyst and not professional traders. Analyst are paid to be right and justify it after it has already happened and most of the time the battle is already over. Here, being the trade has already moved. Using T.T.W trading system, as you can see, it can go along side with double top analysis. The only difference is that there is confirmation and the confirmation is much earlier for a trade entry to minimize risk and to maximize returns. 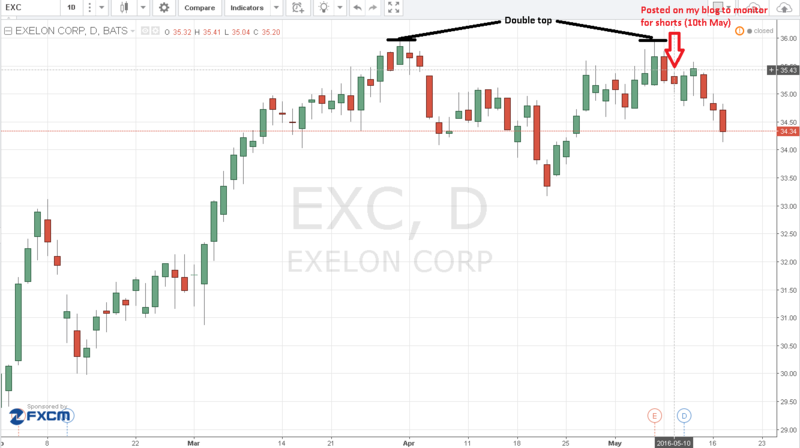 I don’t use double top or bottom analysis anymore but most of the time after I traded a security, I noticed a double top or bottom being formed afterwards. I also like to congratulate all those who traded this after following my post last week on 10th May especially my students as well. 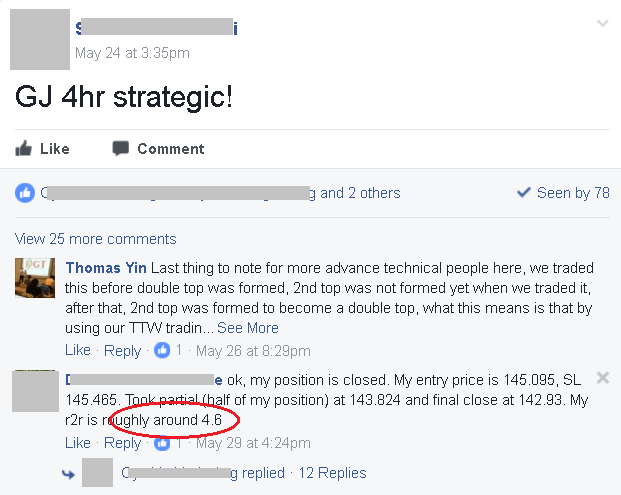 One of my students who have traded this is Joey when he posted on my facebook for students asking whether to hold or start taking profits this morning. Here is the screenshot of it and it really makes my day (even much more than making the money myself) seeing it. Keep it up Joey. 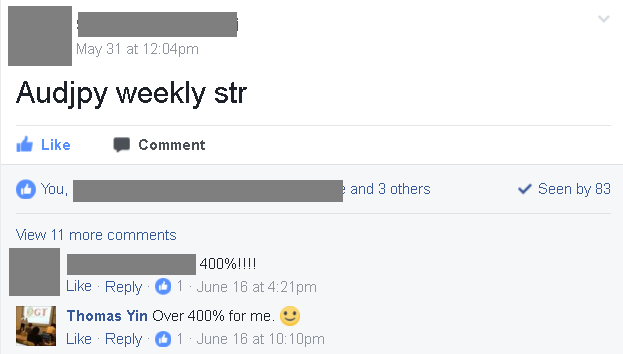 Consistent income from trading is the way to go. Enjoy the trading journey ahead.